Top Posts of 2013: What Do Home Buyers Really Want? With the end of 2013, NAHB’s Eye on Housing would like to take a look at the updates that attracted the most readers over the last year. In February, we looked at survey data of home buyer preferences. Many in the housing industry are wondering not only what today’s home buyers really want, but also what they are ready to leave behind in light of current economic realities. A new study recently released by NAHB, What Home Buyers Really Want, was designed to answer these questions, and more specifically, to provide the most current and accurate information on buyer preferences so that NAHB members can deliver the home (and community) that today’s buyers want and are willing to pay for. So what do home buyers really want? The first answer is energy efficiency. 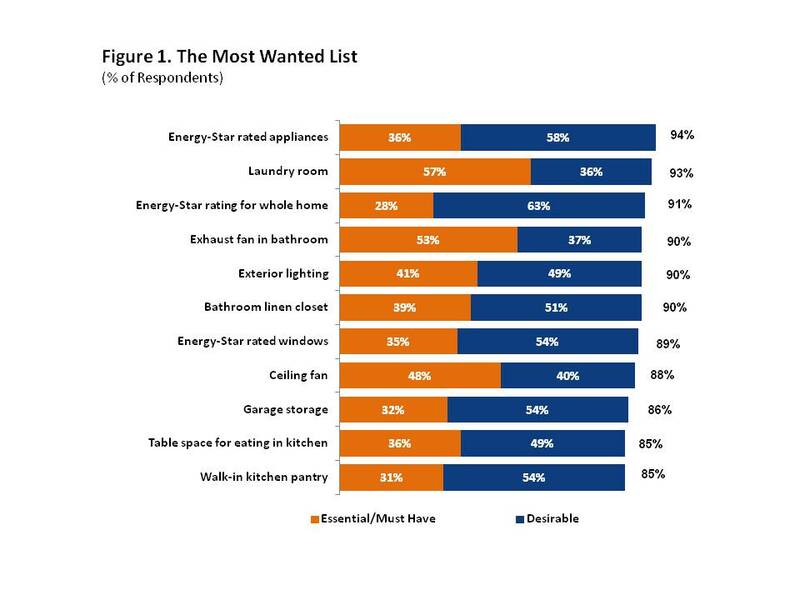 Four of the top most wanted features involve saving energy: 94% of home buyers want energy-star rated appliances, 91% want an energy-star rating for the whole home, 89% want energy-star rated windows, and 88% want ceiling fans (Figure 1). The second message buyers are sending is they want help keeping their home organized. The laundry room is wanted by 93% of buyers; in fact, 57% consider it essential and would be unlikely to buy a home without it. 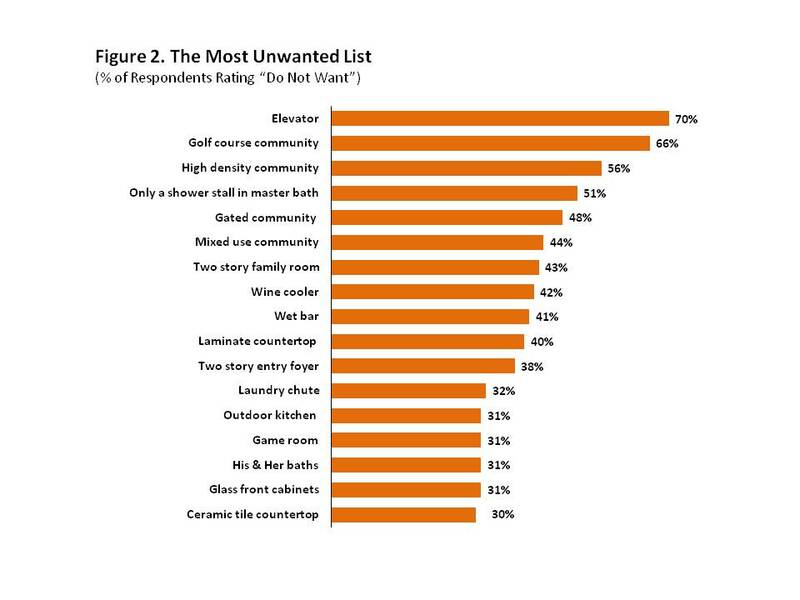 This shows that most buyers want to keep the dirty laundry contained in a room and away from plain view. Moreover, nine out of ten buyers want a linen closet in the bathroom to help keep towels and toiletries organized. Space in the garage to store bikes, sports equipment, or gardening tools also ranks high on the buyers’ wish list: 86% want it. And a walk-in pantry in the kitchen is something most buyers care a lot about as well (85%). What features should builders be careful about including in a typical new home? First and foremost, an elevator. Seventy percent of buyers reject it, meaning they would be unlikely to buy a home that included it. Interestingly, four of the next five most unwanted features are not about the home itself, but about the community. For example, 66% of buyers do not want to live in a golf course community, 56% reject the idea of living in a high density community, 48% do not want a gated community, and 44% would not buy a home in a mixed use community (Figure 2). More than half of all buyers also discard the option of having only a shower stall in the master bathroom with no tub (51%), and many are saying ‘no’ to two-story spaces as well. About 43% of buyers do not want a two-story family room and 38% feel the same way about a two-story entry foyer. Many buyers now consider these large, open spaces as energy-inefficient – the last thing they want for their homes. A complete outdoor kitchen is not an important priority to many buyers either, as 31% flat out discard the possibility of washing dishes, cooking, and keeping food refrigerated outdoors. For most buyers (62%), an outdoor grill will suffice. The survey asked buyers to rate over 120 features as either essential, desirable, indifferent, or do not want. The total share “wanting” a feature is calculated by adding the share who rate it essential plus the share who rate it desirable.